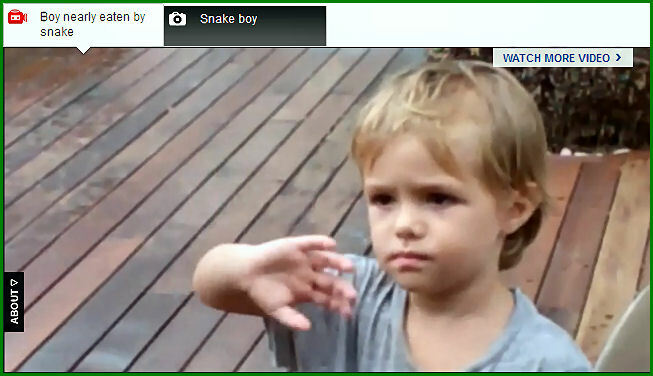 QUEENSLAND toddler Kye Dalton marvelled as the python that tried to kill him was released by a local snake catcher. With child-like innocence the Port Douglas boy waved at the 4m giant and yelled "bye, bye Bitey" on Thursday. 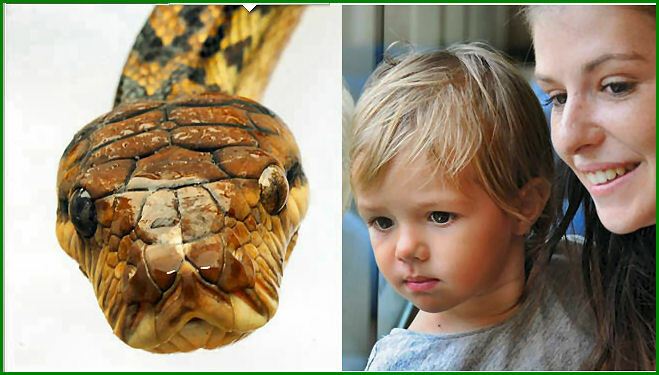 Just two days earlier, the snake had latched on to the brave two-year-old's left leg and coiled around his little body, attempting to squeeze the life out of him before turning him into a late Christmas dinner. Kye's mum, Rachael Sullivan, 20, had watched in horror as the python tried to eat her son. The family's terrifying ordeal with the amethystine python happened just before 8pm on Boxing Day outside their suburban home. Ms Sullivan was cuddling her eldest son Tyiese, 3, and playing with Kye in the partially enclosed carport adjoining their single-storey unit. Mum and son were throwing a ball back and forth when it rolled behind her chair and the energetic toddler ran to retrieve it. The snake is caught and not killed!! Ms Sullivan's neighbours, Scott Tunnie and his fiance Xena Reeves heard the screams and came to help. "Apparently I just chucked Kye at Scott," Ms Sullivan said. "I said a snake had got him and Scott asked where had he been bitten and I yelled 'he's still being bitten'." Mr Tunnie grabbed the snake's head and squeezed as hard as he could. He then began unwinding the massive creature from the child's body. Ms Reeves, a police officer, began first aid as they waited for the paramedic, who fortunately lived in the same street, while Mr Tunnie grappled with the highly agitated snake. It then turned on him, constricting his left arm and cutting off circulation. Overcoming her own intense phobia of snakes, Ms Reeves tried to pull the snake off Mr Tunnie's arm while speaking with paramedics on the phone. It took the help of two more neighbours to finally get the snake under control. Paramedics wrapped Kye's leg and transported the family to Mossman Hospital. But his ordeal wasn't over. During the trip, Kye passed out, prompting fears the snake may have been venomous. Ms Sullivan said she asked staff to swab for venom, but was told they didn't have the authority to do that. "They told me they didn't have the authority to do any swab tests any more, which is strange because we get a lot of snakes up here," she said. Mossman Hospital medical services director Dr Patrick O'Neill said Kye received appropriate treatment based on the clinicians' knowledge and following a full assessment. 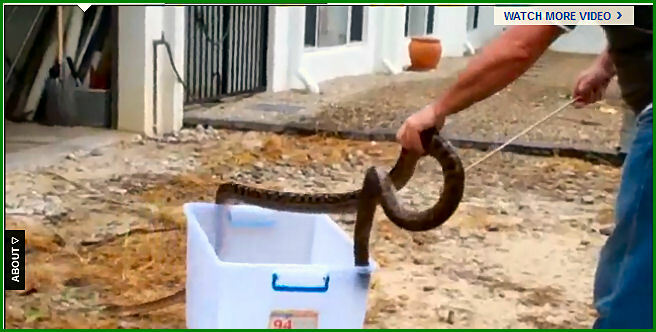 Dr O'Neill said an anti-venom kit was available but was not used because a description of the snake was given to doctors and Kye showed no signs of envenomation. "This patient received the right care, at the right time," Dr O'Neill said. On Thursday, the family confronted their fear, coming face to face with the massive creature during a meeting with Port Douglas snake catcher Dean O'Donohue. Mr O'Donohue had removed the python, now dubbed 'Bitey' - the biggest and most aggressive he's seen this season. "At 3.5m to 4m, it is long but not a particularly thick snake, so it was probably looking for food," Mr O'Donohue said. Bitey has now been released into rainforest.